Unbeaten champion Jermell “Iron Man” Charlo visited the Houston Food Bank on Friday to meet with volunteers and help prepare boxes of goods for victims of Hurricane Harvey alongside his twin brother Jermall Charlo and Houston-based world champion Erislandy “The American Dream” Lara. The Houston Food Bank presented Jermell with a patch to wear on his shorts during his title defense bout on October 14 live on SHOWTIME from Barclays Center, the home of BROOKLYN BOXING™. After visiting the Food Bank, Charlo met with media at Charlo Boxing & Fitness Club in Sugar Land, Texas in advance of his much-anticipated fight against top contender Erickson “Hammer” Lubin. 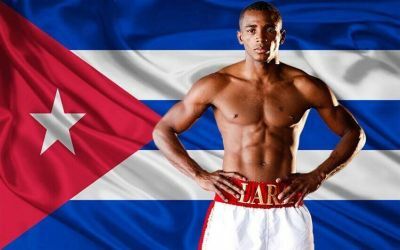 The fight will serve as the co-main event of the high stakes SHOWTIME CHAMPIONSHIP BOXING® tripleheader that is headlined by Erislandy Lara defending his title against undefeated Terrell Gausha. “When they asked me if I was available to come to the Houston Food Bank to volunteer, I didn’t even hesitate. I was in. No matter how busy I am with training camp, I always have time to help for a good cause. “Houston has suffered with Hurricane Harvey. I’ve seen the devastation. Coming to the Food Bank with my wife today is my little grain of sand to help a bigger cause. I come from Cuba, an island that it’s often battered by storms. I’ve seen people lose a lot to Mother Nature. I feel for them. “I don’t think my preparation for this fight has been affected by what happened here in Houston [Hurricane Harvey]. I have endured so much in my life. I had to escape from my homeland to pursue my dream of becoming a professional boxer. I defied the odds and I became a world champion. I got here with hard work and discipline. I’m focused. Nothing distracts me. “I didn’t get a chance to really see my house [during Hurricane Harvey] because I’ve been gone. I’ve been in Dallas training with Errol Spence Jr. and my trainer Derrick James. My uncle wouldn’t tell me anything that’s going on in my gym. Everybody basically was like ‘don’t worry about what’s going on.’ I’m trying to keep my mind off of it. I’m back home, everything is good and that’s all that matters right now. “Erickson Lubin is a crafty young fighter. He’s strong. He’s got some skills. He’s got pop. We’re just going to have to dog it out. Best man wins. Whoever’s in the best shape, whoever’s the strongest fighter, whoever lands the best punches is going to win the fight. “I’m a vet. I’ve been in the game professionally ten years. I grew up in the amateurs. I’ve got the height, I’ve got the size, I’m stronger, I’m faster. “I’ve fought three southpaws. I’ve knocked them all out. I’ve knocked every southpaw I’ve fought out. “Errol Spence Jr. is the perfect sparring partner. He’s been one of the best sparring partners that I’ve had even when I’m fighting right-handers because of his dominance. He’s very strong, he’s fast and he’s punching. “I’ve got Houston on my back right now – me and my twin brother. If there were more fighters in Houston, we would be a bigger team. We do what we can to try to get boxing back into this city. “Why not get a big fight? I’ve fought 29 fights. I’ve fought a lot of prospects. My career has been built up. I beat Olympians. What else do you want me to do? Now it’s time to beat the [Miguel] Cottos and the Canelos [Alvarez] and the Triple G’s [Gennady Golovkin] and whoever else we’ve got to jump in the ring with. “I told my brother that this fight is equivalent to when I fought J-Rock [Julian Williams]. A lot of people are going to doubt him but at the end of the day they’re going to be in his corner cheering him on for the victory. “I told Jermell to continue to work hard and keep striving because it’s going to build our legacy to that next level. It’s going to put us where we need to be to get the best opponents and the biggest fights.